CFS What's This Snowflake Doing in the Garden?! Hi Folks! 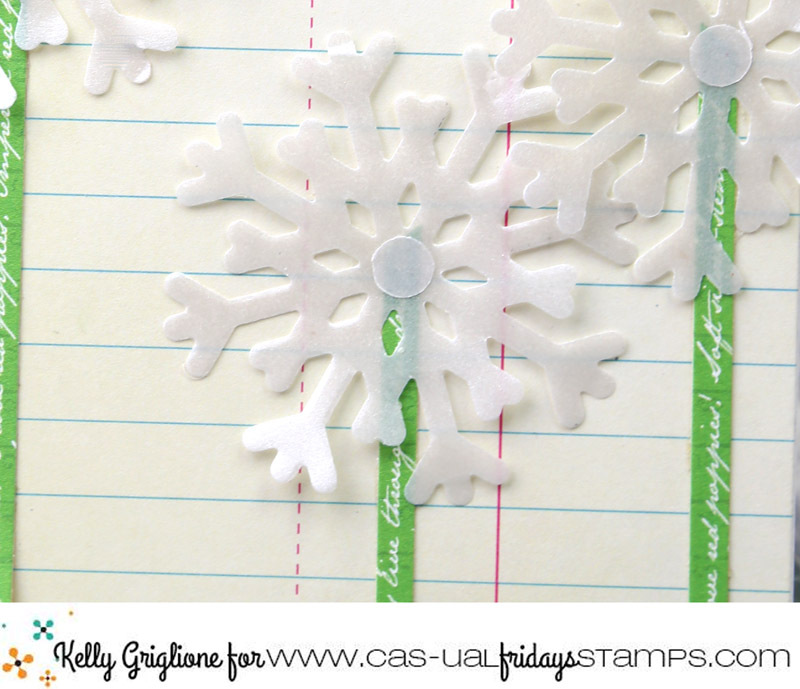 I went rogue on Michele at CAS-ual Fridays Stamps today ... she asked me to create a card with a snowflake, and I'm pretty sure this is not what she was expecting! But I thought this snowflake from Flurry Fri-Dies made such a cute little flower. To further the flower illusion I used strips of scrap green paper for stems, sequins for the middles, and the leaves from Acorn Fri-Dies. This one has dandelions, just before they spread their seeds all over your lawn! Frosted vellum is a great choice to capture the wispy feeling of seeding dandelions. The flowers are laid out the same as the first card (why make it hard on yourself coming up with a new layout?) and the sentiment is the same too, from Shenanigans and Wheat Wreath. I was happy with how this one turned out! I bet I could have layered another snowflake and rotated it slightly to get a fuller dandelion. Hmm ... off to the craft room to check that out! 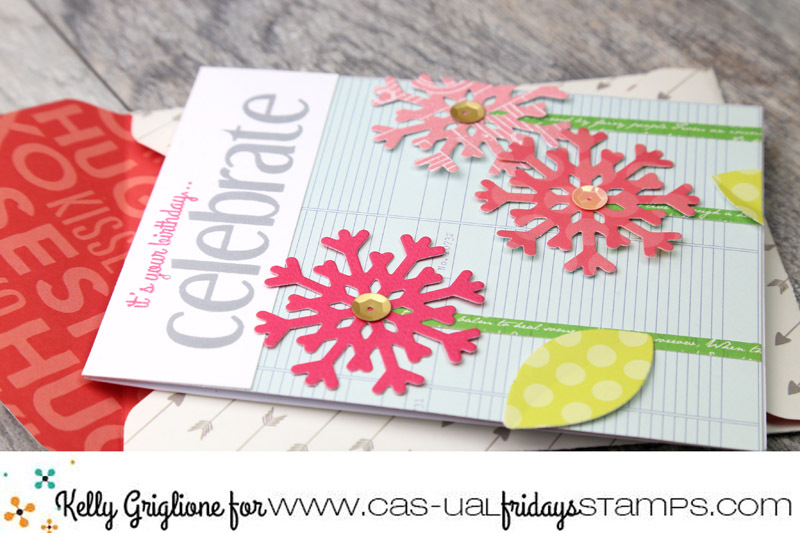 This card is over at the CAS-ual Fridays Stamps blog today if you'd like additional information. 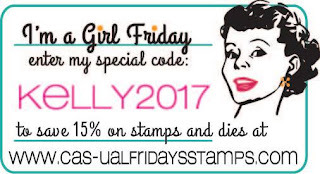 Feel free to use my code "KELLY2017" which will save you 15% off any purchases at CAS-ual Fridays Stamps. 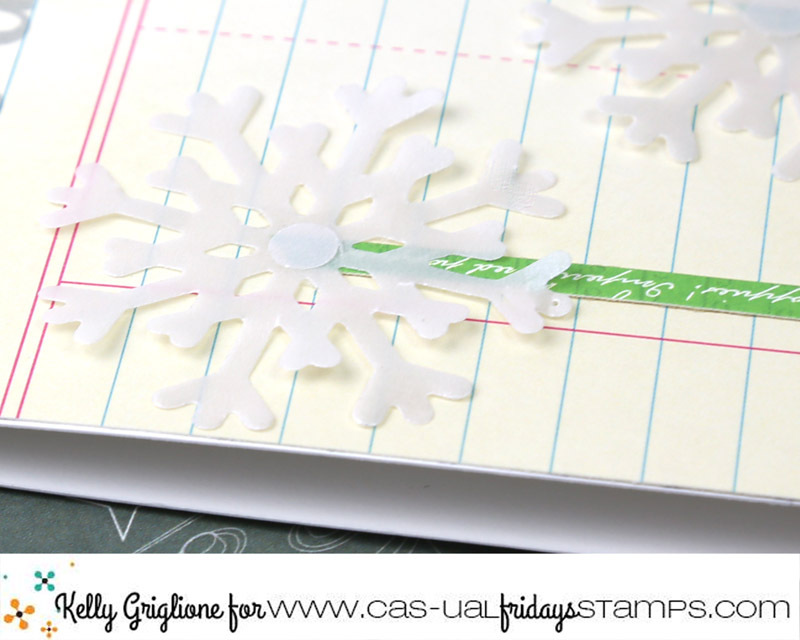 Black Friday Alert: Free Stamp Set from Winnie & Walter! Hello Folks! For all those go-getters who already have your holiday cards ready to mail, decorations up, presents bought and wrapped, I have a project for you ... holiday thank you cards! It's never too early to start thinking about thanking those in our lives who have generously given us treasures with the sole purpose of making us happy. Honestly, I have to admit, I am awful with thank you cards. I get overwhelmed and am usually rushing around at the last minute with all the must-complete projects. But having these thank you cards ready ahead of time will certainly increase the chances of me sending timely notes of gratitude! This card base couldn't have been quicker to stamp with several "thanks" across the middle, and a black secondary sentiment that adds so much. 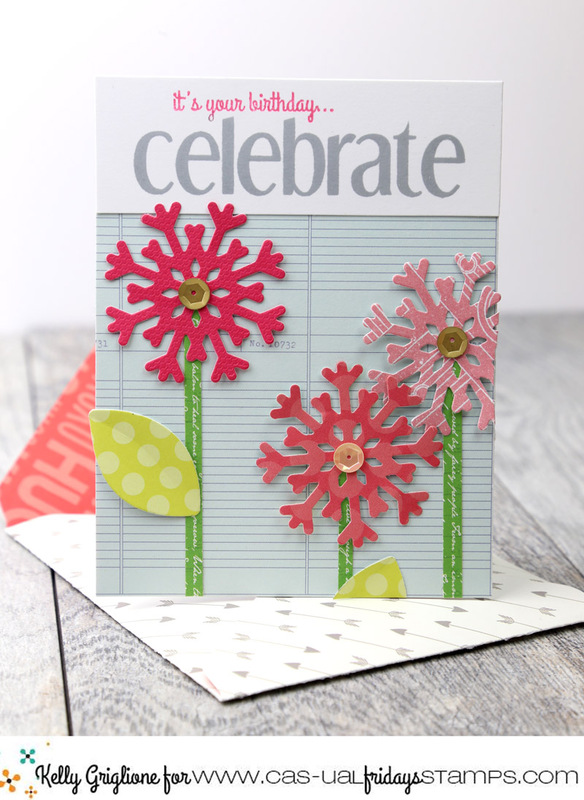 You could choose to add any embellishment to this card base (or even just leave it plain!) 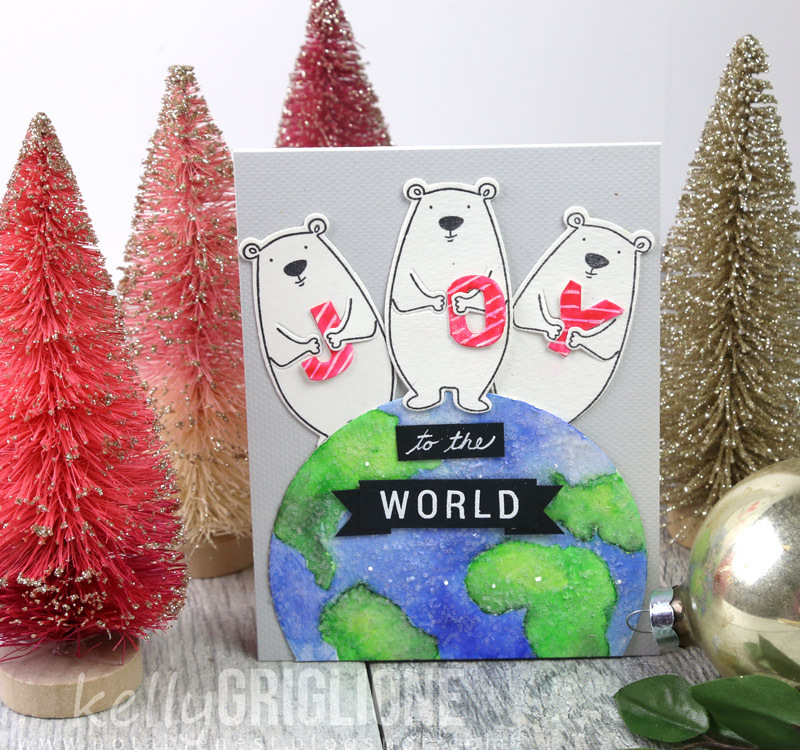 but when there are adorable Christmas critters like the ones from Sweet Holiday with Evelin T Designs I don't need to look any further. This festive puppy is just the cutest ever! Using this formula it's easy to create a whole set of these thank yous, which would make for a great present itself! 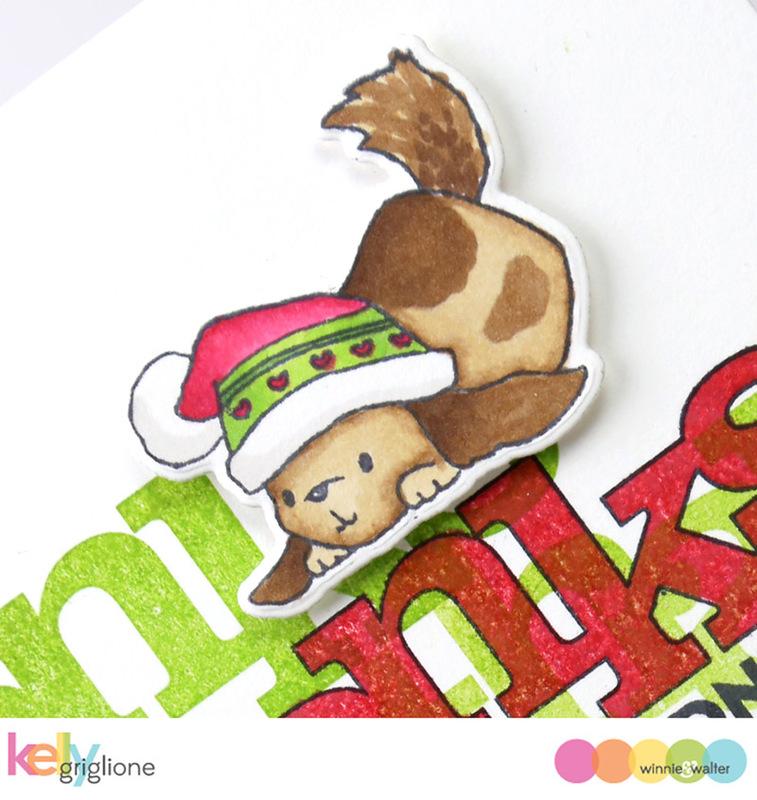 And speaking of adorable Christmas critters, here's another one from that same Sweet Holiday set. Sometimes by the time January rolls around, I'm a little over green & red, so it's nice to add different colors to keep the design fresh. Usually this is the part of the post where I tell you where the stamps can be purchased, but not this time! 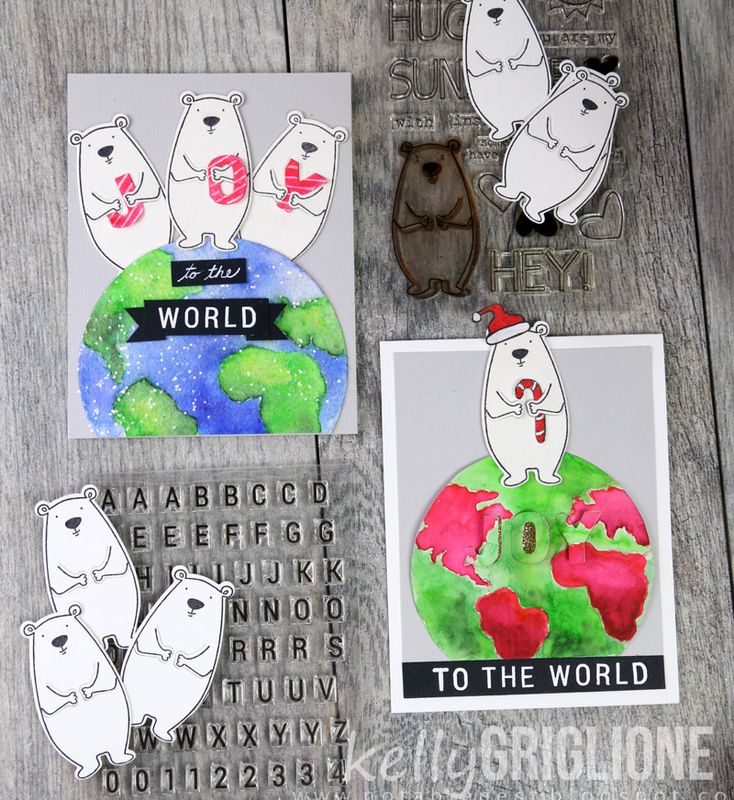 This In a Word: Thanks stamp set is actually FREE with a qualifying $35.00 purchase during the Black Friday-Cyber Monday Sale. I know! 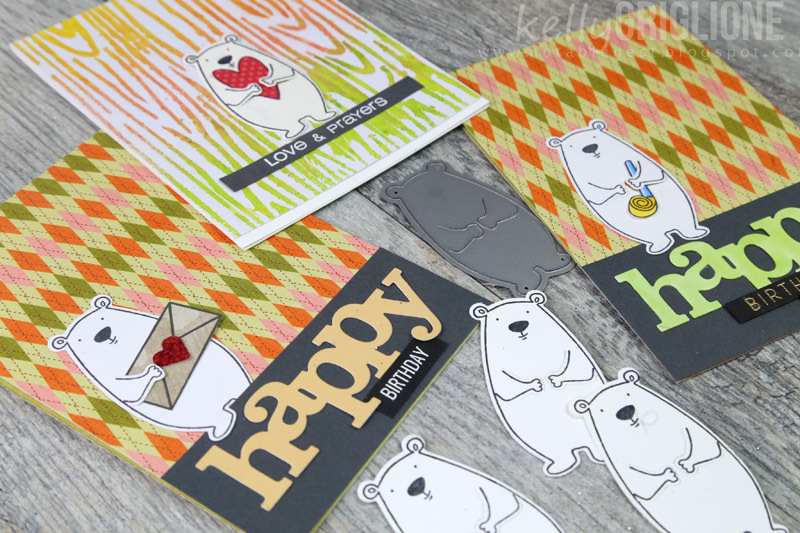 It's not a small stamp set, it's an actual, honest-to-goodness regular-sized 4x6 stamp set full with 4 different "thanks" (including an outline version), 3 secondary sentiments (which I always love to add) and several small designs (like the branch that I added to the bear's present above). Hopefully your Winnie & Walter wish list is up-to-date so you know exactly what to get! Hello Folks! 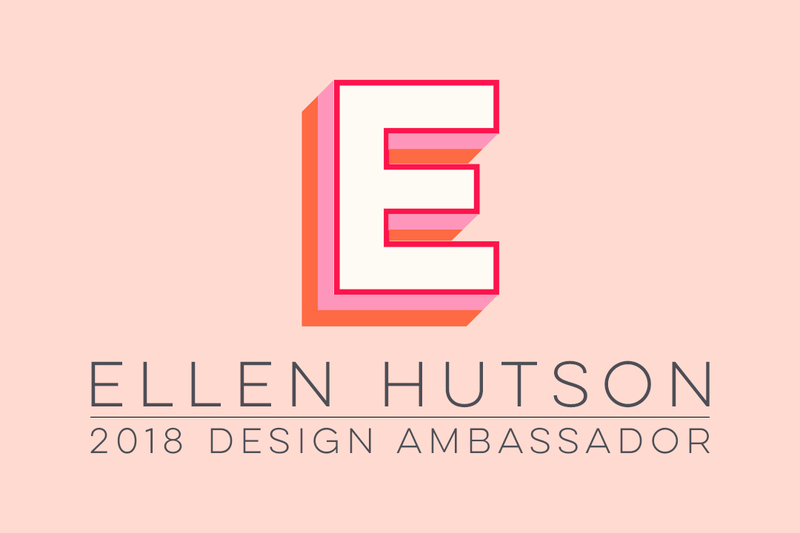 I am SUPER excited to celebrate Ellen Hutson's 11th Anniversary along with a host of wonderfully talented artists! You may have come from one of them, the lovely Carolyn Peeler. I haven't gotten to make a holiday card with this cutie yet, so I was excited to get to work! And here he is, hanging out at the North Pole all majestic-like, wishing joy to the whole world! For the world, I cut out a circle from watercolor paper, lightly penciled in the continents (while looking at a globe on google), and then watercolored them with zig clean color markers. Since it's a Christmas card I made the globle red and green. It was fun not using traditional colors for land and water, and I like how festive it looks! Finally, I washi-taped the Hinged Alphabet Dies to keep the word "joy" spaced together, and ran them through the die cutter. Another advantage of the hinged alphas is that you get the opportunity to hide a little surprise underneath. When you look at the card from the side you see all sorts of gold sparkles coming out, like the world is literally bursting with joy! I guess a fourth reason I love this bear is that Julie has thoughtfully designed accessories for him, kinda like paper dolls! The Bear Wear 2 set has Halloween, winter and Christmas accessories to get your bear prepared for the holidays. I've added the Santa hat and candy cane here, but there are many other accessories to choose from. 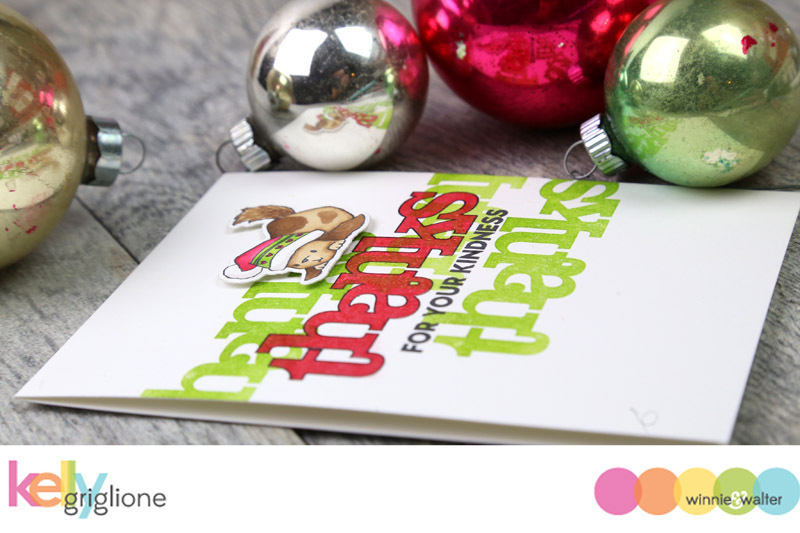 For this card, I copied an idea I had my kids do for Christmas cards one year. I made them large J, O and Y letters to hold up, and I took a picture. They had a ton of fun being silly which made for a fabulous greeting. 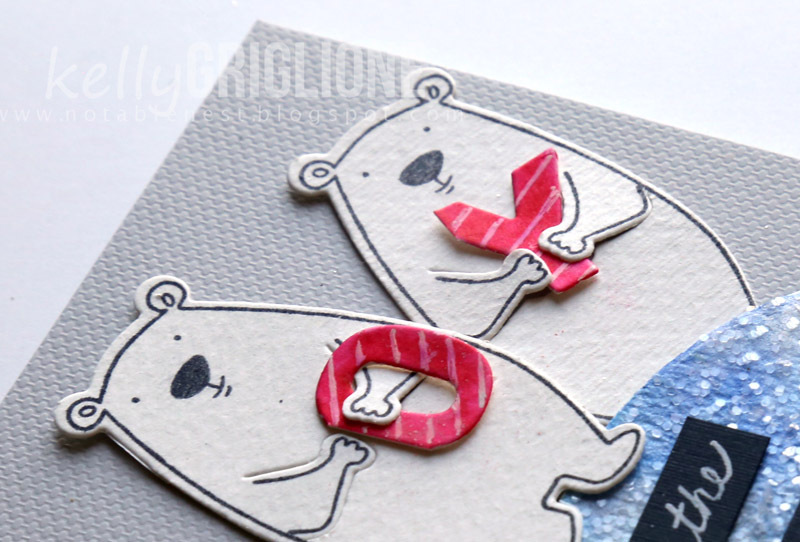 These bears can hold things too, so why not have them spell out a sentiment? 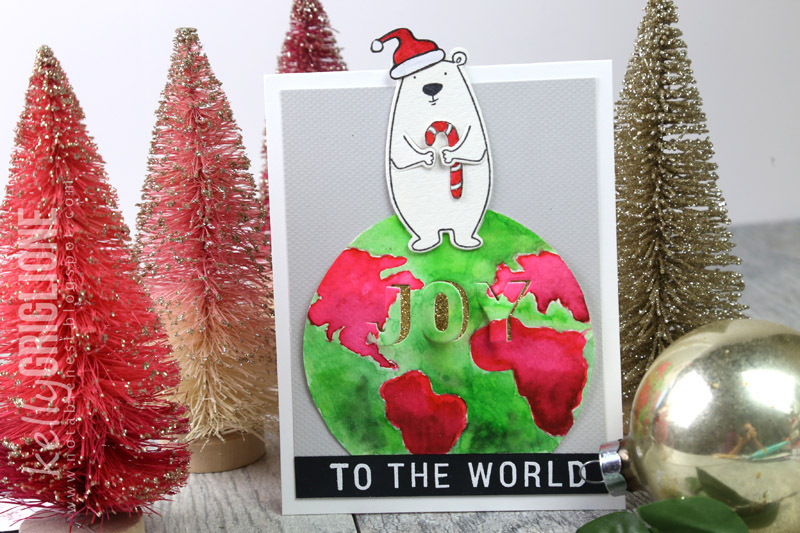 The globe is made the same way as the first card, only with traditional colors, and a healthy dose of glitter on top to make it all sparkly. The sentiments in all caps on both cards are made with the Basic Alphabet set. Just perfect for occasions like this where you need to finish off a phrase. I wanted "to the" to be smaller (so more of the world would show) so I just hand wrote that in script. The black fish tail ends are hand cut as well. 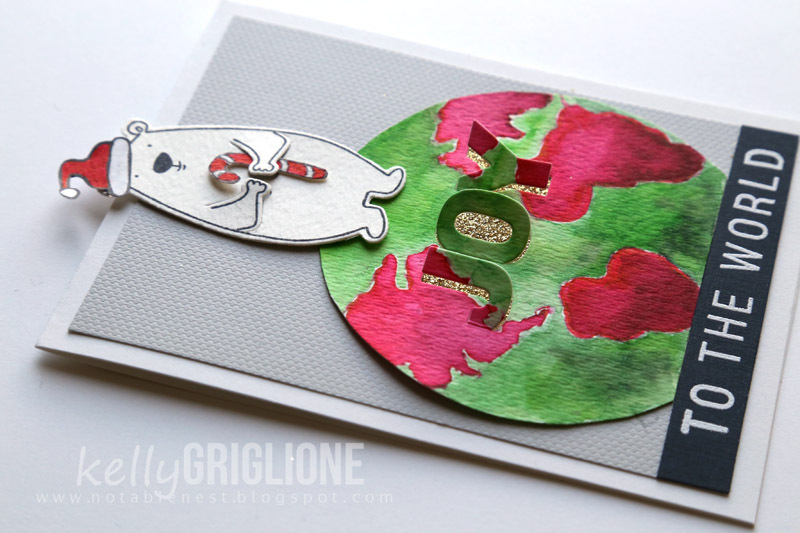 In fact, I took this opportunity to use up some of my empty card bases, extra sentiments, and stray embellishments, and turned them into three more cards. All of the elements are recycled from prior projects. Such a good feeling to clean and be productive at the same time! 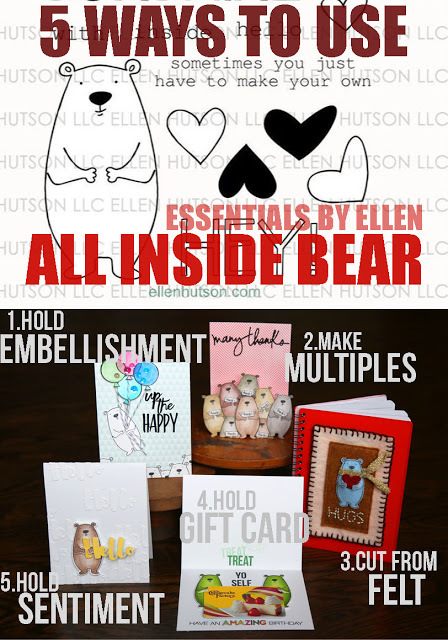 And what a great illustration on how the All Inside bear goes with just about anything. 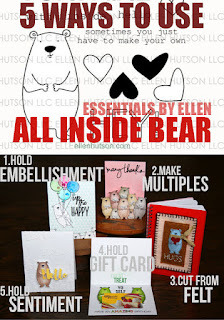 The heart, envelope and party horn are all from different stamp sets that aren't even designed by Essentials by Ellen. Love that! 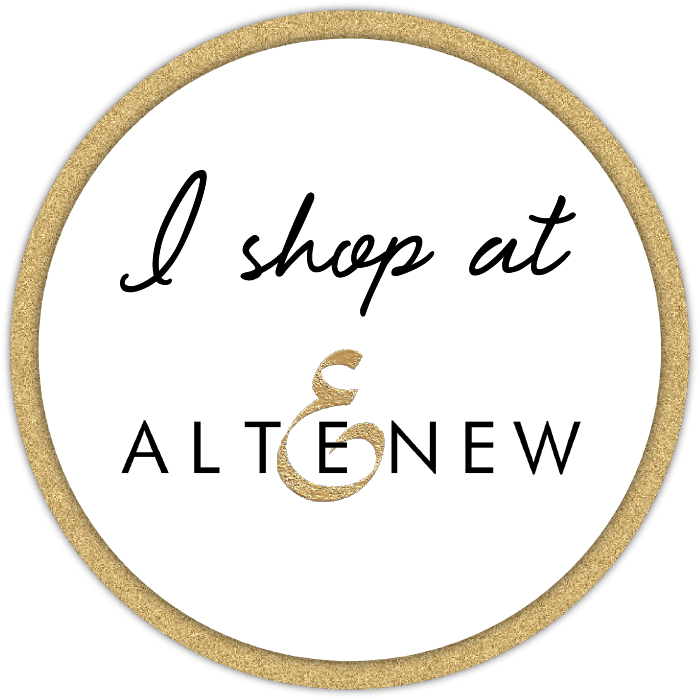 Thanks so much for taking a look and letting me share my favorite Essentials by Ellen set with you! The fun continues at the delightful home of Laurel Beard where there's something wonderful waiting for you! 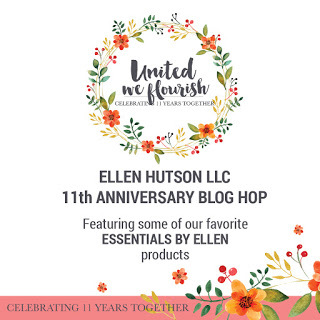 A huge thank you and HAPPY ANNIVERSARY to all the mighty fine folks at Ellen Hutson LLC! 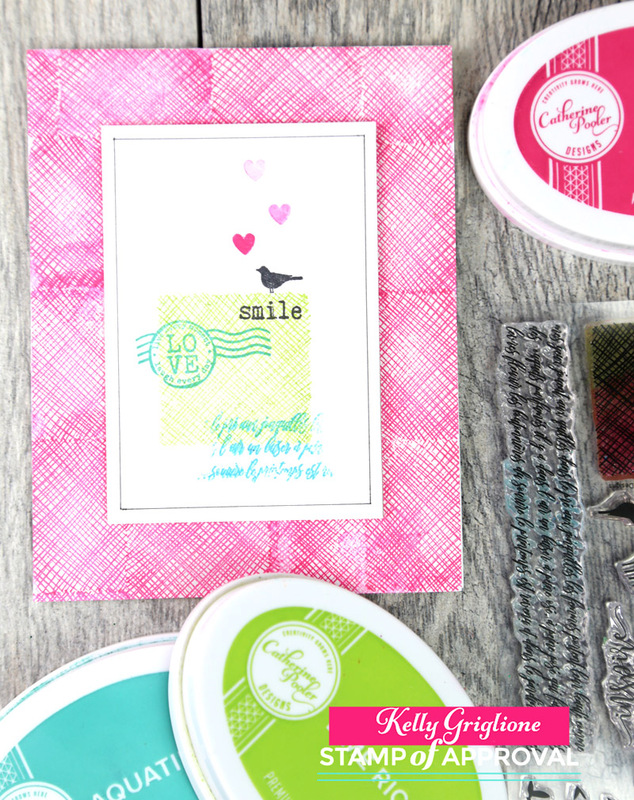 This card uses an assortment of stamps from the Birds of a Feather stamp set. 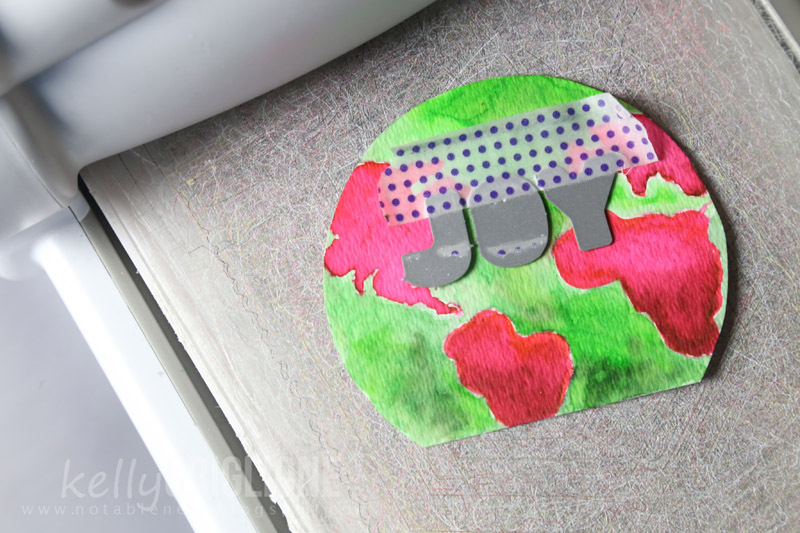 On the panel, the cross-hatchy stamp in green makes a nice place for everything to start from. I stamped just a portion of the script border stamp along the bottom and the postmark. The tiny bird perches on the top and sings a love song. 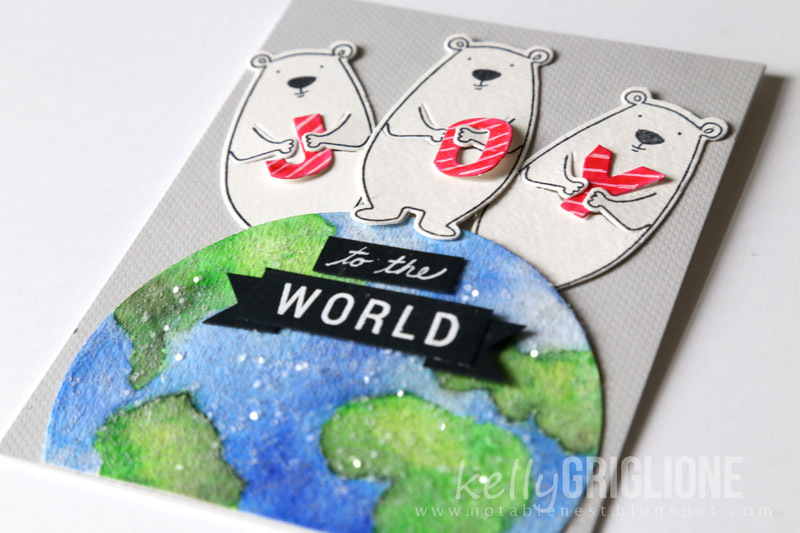 This is more of an eclectic way of stamping, with several smaller stamps in a collage-like style. I don't often design cards this way, as it doesn't come naturally to me and therefore usually takes longer to arrange the elements. But it's fun to do once in awhile! 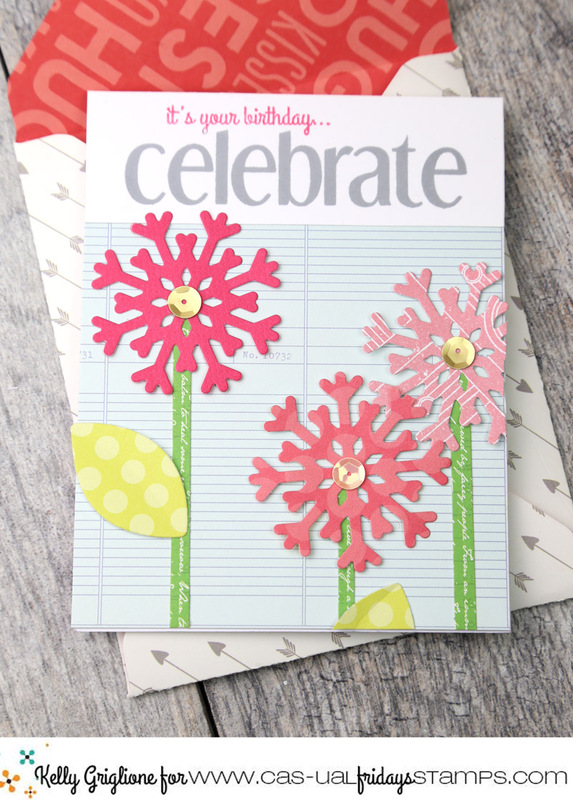 The cross-hatchy stamp comes in handy again to transform the card base, stamped in pink Party Dress. 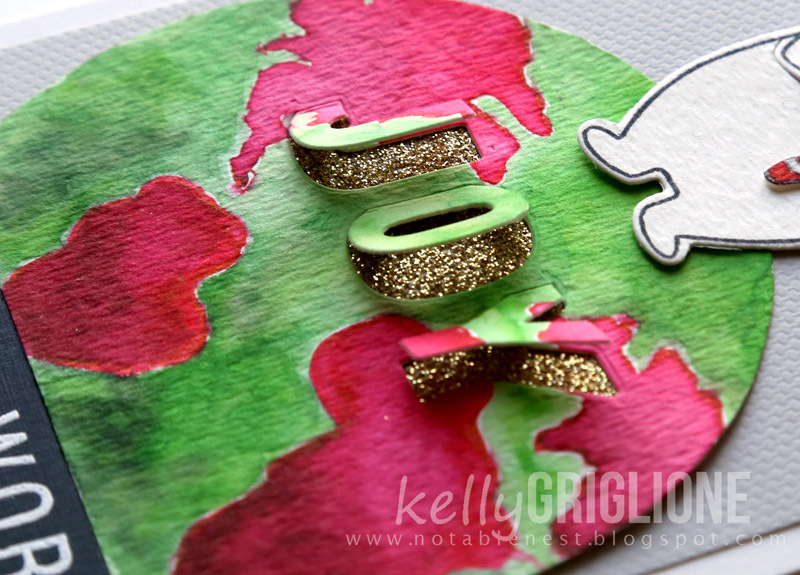 Instead of looking for a patterned paper, just make your own! You'll see I didn't spend time lining up the stamped images ... some overlap and some leave a gap. Gives it a casual patchwork feel. Have a wonderful day! And thanks so much for looking! Hi Folks! 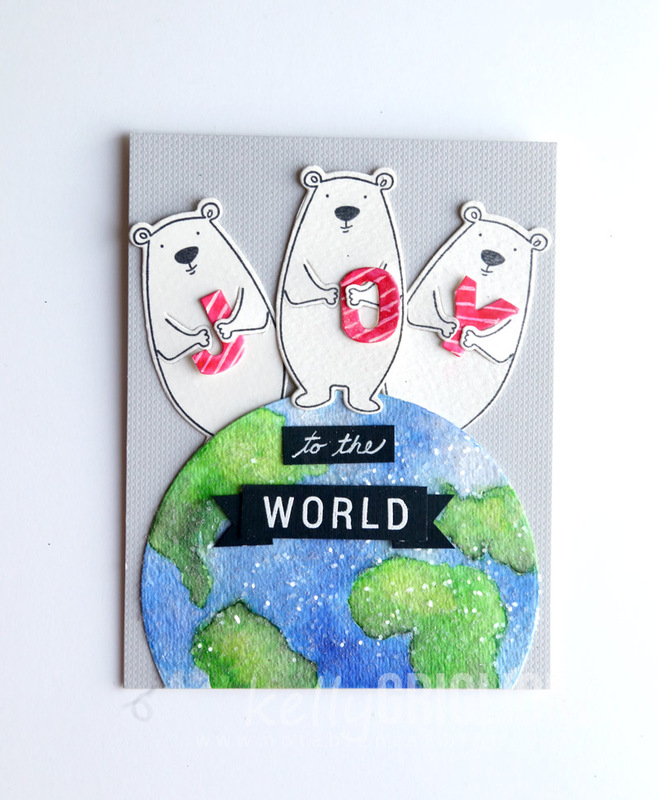 I'm excited to share this project on the Winnie & Walter blog today! It features the new In a Word: Holiday Tiles Cutaways from this November release, and a special, "bright," surprise! Honestly, folks, this never gets old. NEVER. Every time I make something light up on my card I get silly-excited. Every. Darn. Time. This time it's a sheet of ice that this cute bird is skating on! Shall we peek inside? This is what it looks like underneath the panel. 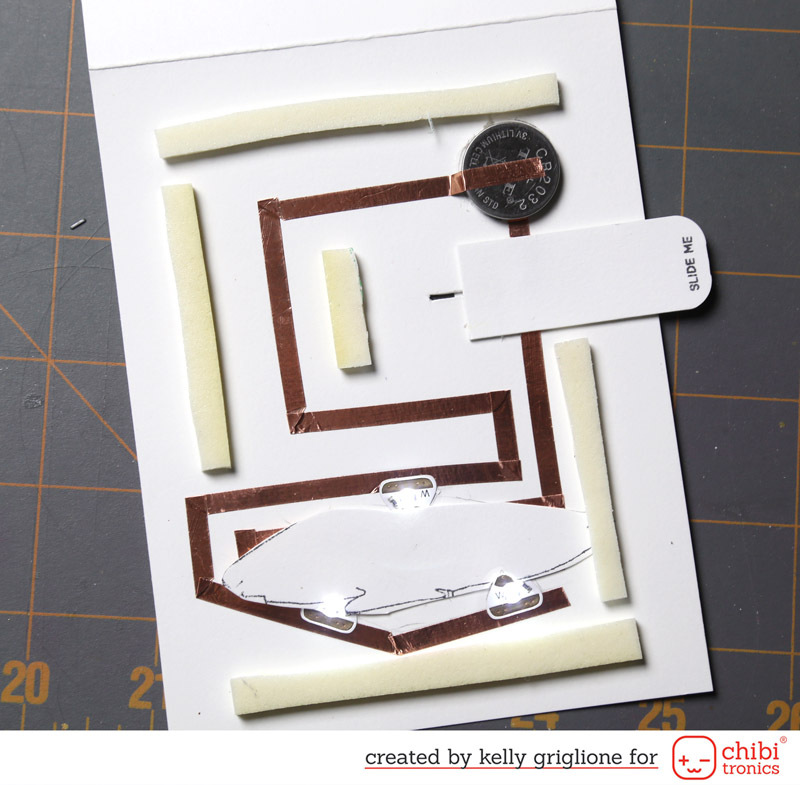 At a high level, we've got the Copper Tape, interrupted by a gap on the negative side so that the pull tab (stamped with Interactively Yours by Heffy Doodly) can complete the circuit. This turns the White LEDs on. The foam tape raises everything up to the height of the CR2032 Battery. In the middle of the lights I've layered an additional piece of "ice" to cover the copper tape so that it doesn't show through the vellum that will cover it. Here's the finished card before the lights are turned on. 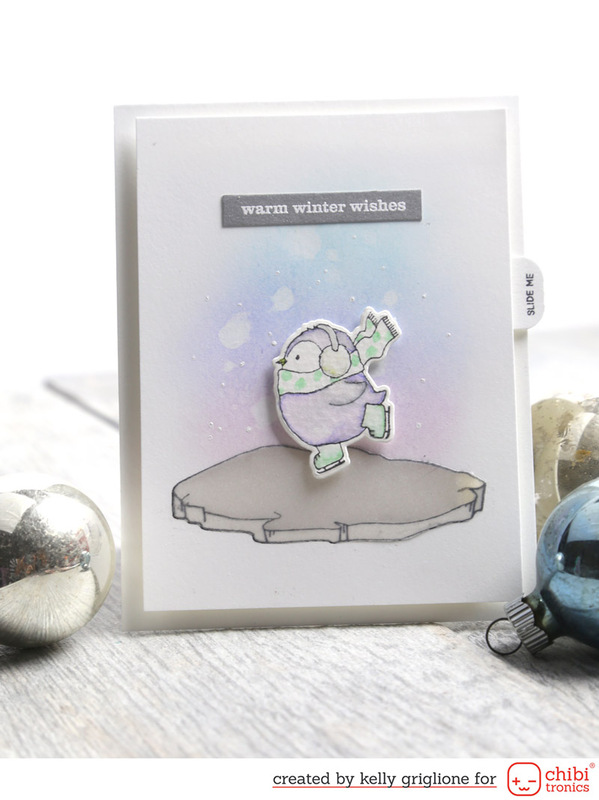 The sentiment, skating bird, and ice are all from the newly released Winter Wishes with Evelin T Designs set from Winnie & Walter. The background is sponged distress ink that has been splattered with water. 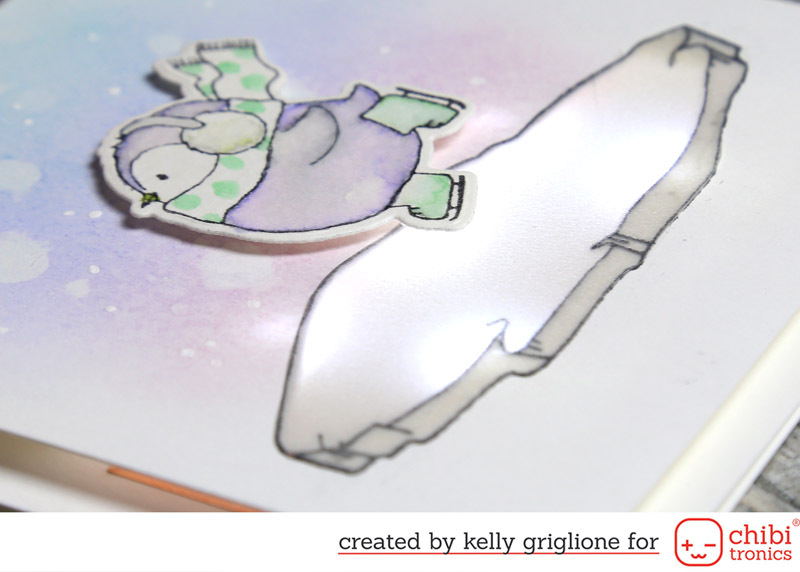 I’ve also added some white dots with a gel pen for additional snowy effects. Ack! You better believe I was monkey clapping after this! How fun to skate on a sheet of ice like this. With a pair of cute ear muffs, naturally! 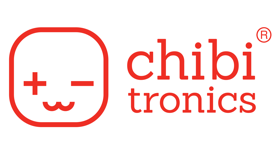 If you would like to see the full instructions and photos for how this card came together, I welcome you to check out my post on the Chibitronics blog. Stay warm, and thanks so much for looking! Hi Folks! Unfortunately with the lack of rain we had in August and September, the leaves in the Midwest never really got to show off their brilliant orange and red hues. Instead, many of them went right from green to brown. So sad! It definitely got me yearning for and searching out those wonderful colors, in real life AND in my craft room! For these colorful leaves I made a stencil from one of the leaves in Acorn Fri-Dies and sponged lots of Catherine Pooler Ink inside. 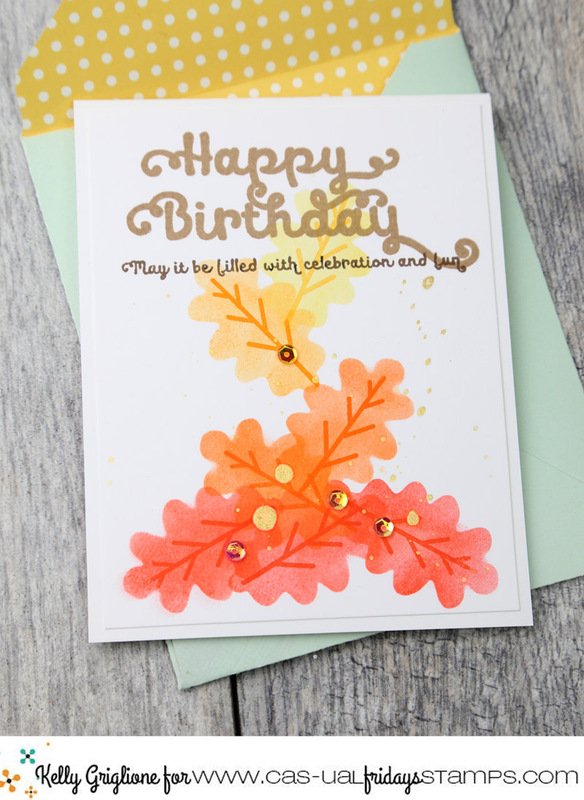 The leaf vein from Autumn Blessings is stamped with the same ink color that was sponged to make the leaf. 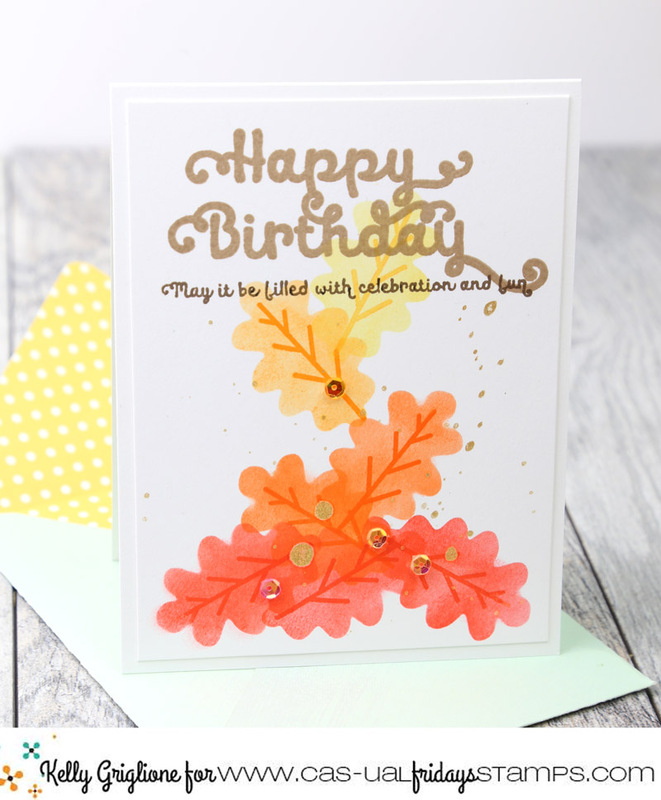 For the main sentiment I used So Pretty, and I was happy to realize that the secondary sentiments from Shalom work perfectly for birthday cards as well! To finish it off I splashed some gold Glitter Mist, covering up the sentiment first so the splatters just stayed on the leaf part of the card, and added some sequins. 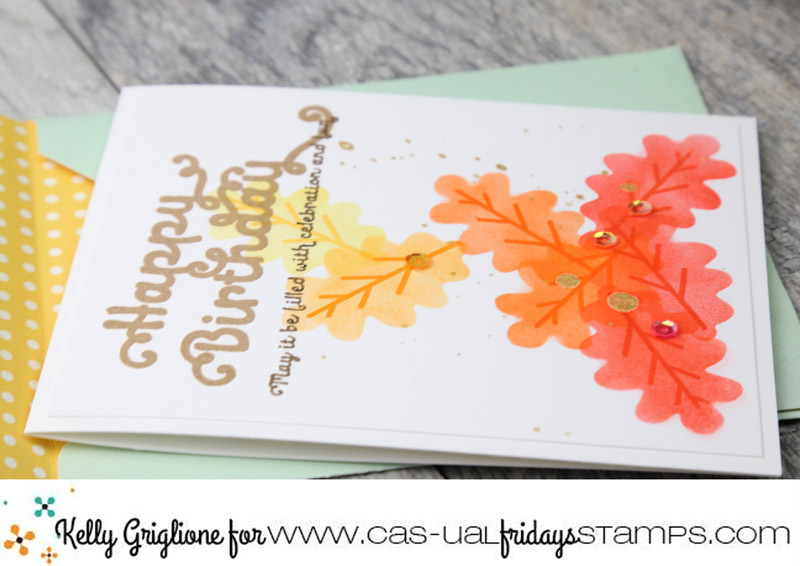 This card is also over at the CAS-ual Fridays Stamps blog today if you'd like additional information. Feel free to use my code "KELLY2017" which will save you 15% off any purchases at CAS-ual Fridays Stamps.